Kwasi Boyd-Bouldin: The title of this series is Local. It is a play on both being a "local" to Los Angeles, as well as the fact that all of the images were shot locally. My photography is an extension of my desire to communicate the innate, overlooked, and vanishing beauty that can be found throughout the changing neighborhoods of the city. KB: I'm constantly inspired by the city of Los Angeles, both it's structural composition and the people that inhabit it. Growing up in East Hollywood/Koreatown has given me a unique appreciation of everyday life in the city. I strive to promote and preserve that underrepresented version of LA to the world at large. AM: What is your favorite place and/or thing to photograph in LA? KB: My favorite part of LA to photograph is East Hollywood. The reality on the ground contrasts so harshly with the way it's perceived by outsiders that it's an incredibly interesting place to shoot. I also have a great deal of personal history tied to that area that draws me back to photograph it time and time again. AM: You mentioned your work focuses on the changes in the city. What have you gathered about LA over the course of shooting? What about in this particular series? KB: As a whole, Los Angeles is undergoing a massive transformation right now. In some ways, it's bittersweet. There are many positive developments such as the new Broad Museum, the expansion of the Metro transit system, and the revitalization of Downtown LA. Unfortunately though, with so much being added, a great deal is being lost as well. Our rental market is ridiculous, and the pervasive issue of homelessness remains largely unaddressed. People, including many that make up the heart and soul of the city, are being pushed to the margins to make room for luxury apartments and condos. My work in this series, as well as in most of my portfolio, is focused on documenting these changing neighborhoods before they are gone. There is a beauty to the desolation that is being lost, a working class aesthetic that is being erased form the mainstream narrative at an alarming pace. AM: We love your documentary style of photography. When you're shooting—how much of it is instinctual vs. planned? KB: I like to think that it is planned but honestly, it's mostly instinctual. I'll start in a particular area and start walking and just thinking. Next thing I know, it's been 2 hours and I'm in a completely different area. I enjoy wandering, that's the main element in my creative process. I often traverse the same neighborhoods, so changes such as torn down buildings or new graffiti jump out and catch my eye. KB: Next year I'm releasing a series of printed zines and will be selling them online through my website, The Los Angeles Recordings. I also run a Film Photography zine with a few friends called Snapshot Galleria that will be putting out printed issues as well. In general, the goal is to just keep shooting and find more ways to connect with people. 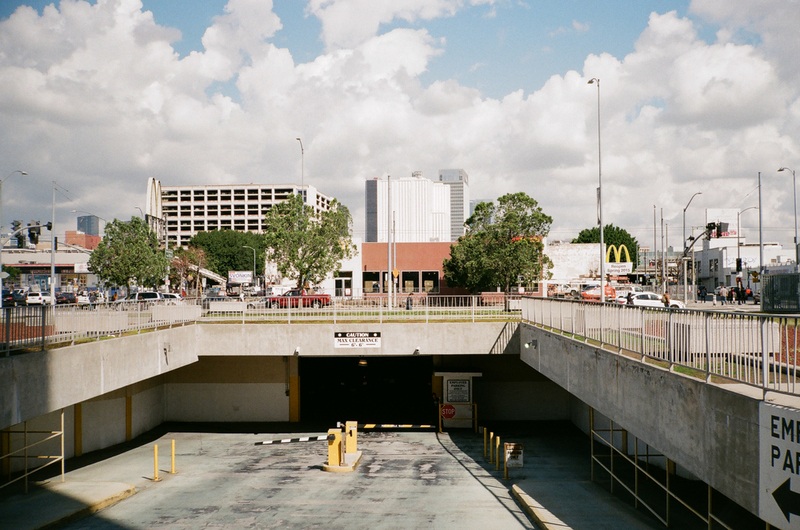 Kwasi Boyd-Bouldin has been documenting the Los Angeles urban landscape for over a decade. His work is an examination of the physical structure of neighborhoods and how they are molded and reconfigured by outside elements (demographics, gentrification, the passage of time). You can find more of his work at thelosangelesrecordings.com.